The shifting saga is not over yet. I searched my mind for some other interesting story to tell you but the mind remains stubbornly blank. Well I can’t blame my mind also…..it has never in its life ‘shifted’ anywhere and the upheaval caused by the move cannot be glossed over. See, my mind is a creature of habit. Because it is a creature of habit. I apologise, please go easy on it. My mind, I’m talking about my MIND. It’s still living in the past. For instance as soon as we get out of the lift it persists in turning right instead of left simply because for the past 12 years it has been turning right to reach home. It[my mind, my MIND] also directs my hand to reach for certain ingredients in the kitchen at odd places, in short wastes so much of my time. It’s almost one month since we moved in but my poor little mind still lives in my old apartment. Me, I’m beginning to like my new home now and see potential and possibilities. The first 2 weeks were terrible but now I’m much more relaxed. Down to the last 3 unopened cartons you see. You still have cartons to open????? Yeah *shamefaced* but only 3-4 of them. See the problem with me is that I’m easily distracted…….for me each carton was like Pandora’s Box. One could never predict what one would find in them. Some of the things, I hadn't seen in years. And totally evil stuff. The carton with books were the worst….and it's not just me, each of us would pause on the books we liked, then slowly wander away from the unpacking scene to sit down and read. Once the books were given their due the photo albums demanded their share of attention. The kids were so thrilled to go through the pictures of their babyhood[I had stashed them away for safety reasons…like sticky fingers] and I had to explain the circumstances under which each picture was taken. Not a single picture reflected tranquillity you see and so couldn't blame them for demanding explanations. After we finished with that, came the carton with my puzzles. It was like meeting up with old friends. I don’t know if I’ve ever told you but next to my love for reading comes my fascination with Jigsaws. When the kids are busy checking out the latest toys in a Toy Store I can usually be found in the aisle where the Jigsaw puzzles are kept. I’ll not be joking if I said I can spend hours looking through the choices the store has and finally even if the kids didn’t choose anything I would have picked up a puzzle pack. The more the number of pieces in the puzzle the more I am entranced. The better-half never understood my fixaton with them. When I edged towards the cash counter he would give me that ‘Not another one’ look and I would pretend not to notice and march off with my jigsaw pack safely cradled in my arms. Now interest is one thing and the ability to put them together another. No doubt I’m a passionate Jigsaw puzzle devotee but I lack the dedication to see it through. I certainly begin well; the initial 100 pieces are pieced together in a matter of hours. I would be at it whenever I had some time to spare and even manage to complete the puzzle say 70% of it within weeks. Then I get stuck. The main culprit is usually the sky or the sea and sometimes it’s both. Darkness and shadows are other terrible images to put together. Days stretch into weeks and weeks into months. Soon the pieces would find their way into the kitchen and onto the balcony. Some of them even hide themselves in the vacuum cleaner. The worst is that the better-half is the one who always finds them. I would wince inside when he stood in front of me with a piece [which he would have fished out of don’t ask where and dammit how is it that only he finds them] and not say a single word. After a few repeated confrontations like the above I would admit defeat and mournfully bundle up all the pieces back into its covers and pack it away safely. You’d think I’d have learnt my lesson but no, within a few months I’d buy another pack and go through the whole ringamole once again. The thing is, everytime I pick up a new pack I convince myself that this time I’ll definitely complete it. Truth be told I have completed many but the plain fact is that I have more incomplete stuff to my credit. Like I said the sky and the sea just scramble my mind. After working on it for a few weeks my mind starts turning everything into a jigsaw. Anything I’m looking at sort of form into odd shaped pieces and start piecing themselves together. Just like how tetris blocks keep falling everywhere you look…ermmm tetris addicts will know what I’m talking about. One fine day I made a decision to stop buying until I finished the previous. It was hard but I kept my word, to myself. I still went and examined all the new puzzles in the store and studied the pictures and dimensions very carefully but did not buy. Though I was totally convinced that ‘this one’ is something I can definitely complete. Wait, why did I bring that up now when I was talking about unpacking??? Because I’m back at it again. This time with a new purpose. See I got this brilliant idea, some of my walls were looking so bare so I thought I’ll piece together these puzzles, get them framed and put them on the wall. Howzattttt!!!!! Here are a few I've been working on…. It all started when the kids took this puzzle to fix and asked me to help I ofcourse couldn't resist. I was so rusty initially that I mourned the loss of my jigsaw piecing skills. But like we never forget how to ride a bicycle I got back into rhythm after sometime. Together we fixed the puzzle in one day and were very thrilled with ourselves ‘Hmmmmm, haven’t lost my touch*pat, pat went my hand on my back*’. But it was just a 300 piece puzzle I cautioned myself. The kids then took this one out with the same enthusiasm but soon gave up as a 1000 piece puzzle was a different ballgame altogether. They compensated by picked out the edges, the sea and the sky and helped me a lot. I fixed the houses, the path and the greenery in 4-5 days and then took more than 1 week to put the sea and the sky together. Just look at it......the sea and the sky I mean, just pieces and pieces of light blue and dark blue. It was really tough but I made it. The satisfaction I got cannot be explained. Because this was one of the incompleted puzzles which I left half-way a year or so back, convinced that the sky and sea were inpiecable[if there is a word like that] by a normal human being. The better-half was impressed, not that he told me so in words but I could make out;-D.
Now this one is one of my oldest and a favourite. I have pieced it together more than once. I have this one memory of this puzzle. Almost 10 yrs ago when I first attempted the picture I started with the puppies first…..after a lot of trial and error I pieced together all the 6 puppies and found that I still had bits and pieces of puppy nose and paws and whiskers left. I simply couldn’t imagine why these extra pieces were there in the pack. I then pieced together the wooden chest and the fabric hanging behind the puppies. When I was nearing the end I found a gaping hole next to the 6th puppy from the right. And what do you know, all those extra pieces came together to form a tiny 7th puppy in the corner. It was such a lovely surprise and I still remember my excitement at piecing together something which wasn’t even there in the picture. A few years back my brother-in-law was going to Singapore/Malaysia and I asked him to get me a puzzle pack from there. You see I had heard about and even seen some beautiful puzzle packs from there, especially the famous paintings from the bygone[Renaissance, etc] era which were promoted as puzzles. So I explained in detail what I wanted and he said he knew all about it. Then he comes back and gives me what I still think is the largest and the most complicated one. I took it out just once but kept it back within days. It was working out to be bigger than my dining table. And the bil got what he wanted, I never asked him for anything again. I am now occupied with the above. Like the earlier one, I had attempted this one too a few years back and had given up half-way. 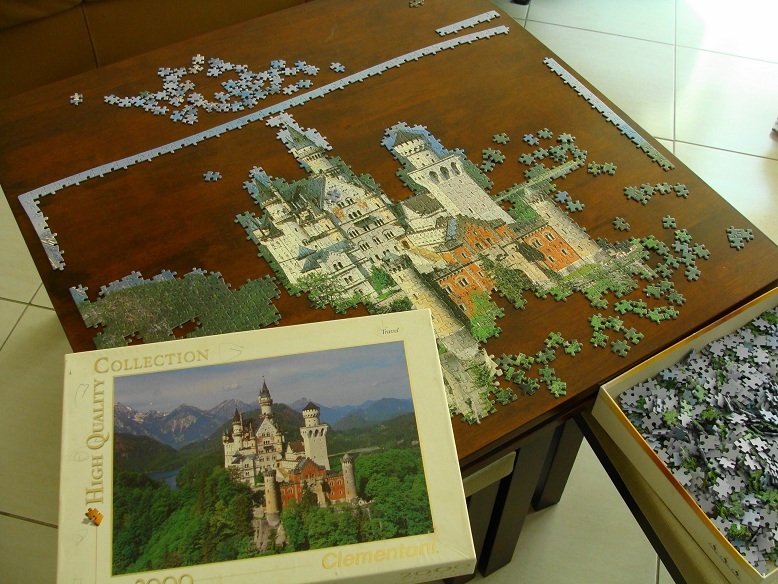 I know it’s not going to be easy, for this one has double the pieces, the sky & forest are already giving me the creeps. But the confidence I gained after completing ‘Road to the Sea’ is something else. Makes me feel very optimistic:-). The mind is a strange thing......whenever I'm doubtful it keeps spurring me on. Like Buddha says "The mind is everything. What you think you become". But he wouldn't have ever thought it would get twisted this much out of context;-). Oh my goodness- the puzzles are amazing- I am still on the kiddy puzzles- yours are masterpieces. What a clever idea to put them together and frame them!! Hehe....u think so, thank you:-))!!!! If I hadn't gone thru it first-hand[this mental shift business] I wd have wondered what u are talking about;-o. So glad you're almost settled in Nancy. Will you post a few pictures of your new place? Almost is the key word here;-D.
Heeeeee as soon as I unpack the last of the cartons;-P.
One thing I've realised it's not everybody's cup of tea, most people find it really boring;-D.
You know, the other day I looked through the glass window and saw you deeply engrossed in something. It must have been the Road to the Sea. Jokes apart I think it's the window which is particularly helped[ing] me. The sunshine pouring in is so useful to differentiate btn the various shades of the same colour. I dont blame u Tara, I've checked out Mona Lisa many times....it's too tough. You are talking about the 1500pcs pack, right??? It's not about boring....I'm never bored while doing it but I get frustrated when I can't recognise which part of the puzzle some pieces come from;-P. Like the greenery in the castle pic above, I'm presently tussling with pieces which I dont know are from the right or the left side[forest] of the castle;-(. Wow Nancy, aamazing is the only thing I can say! 'Little difficult' is an understatement DI....even if I sit everyday with it, it will take me minimum 2 months to put together;-P.
Hehe my daughter asked me the same question one day when she got tired of picking out pieces for me....I had no suitable answer to convince a 10yr old;-D.
This is simply amazing! Gosh1 so much patience you have! Salute! U said it....patience is the keyword here;-). I am terrible at puzzles, I just don't have the patience for them. The better half on the other hand is a pro. Your last line, the Budha quote is so relevant for me today. Everytime I come across that quote it give something new to think about:-)). For heavens sakes don't apologise and make me feel guilty Swaram and u knw why;-P.
Ohhh I love the sound of tht....many a time I wished I had a friend who shared my interest & have lots of fun. But the only person who shares my interest in this is my SIL but she is so far away in India;-(. U just see....when the pieces start slowly falling into place, all of u will get so involved it will be finished before u know it:-)). But you have whetted my appetite to try something new. BTW how are you going to frame them up? Oh Amrita u must give it a try...if u like solving puzzles then u'll definitely take to this. Post pics once you have done..
question: how will you move it to be framed once youare done.. will you stick all the peices on a board and take it? Hey thats a very good idea....the footnote I mean:-). Yeah I'm planning to stick it.....the more recent puzzles come with a packet of glue powder which we are supposed to dissolve in water and brush over the completed picture. That should do the trick I guess;-). Hehe it is a compliment coming from you:-))!!!! what a gr8 idea of framing a puzzle! But thanks anyway....I'll take compliments whichever way;-D!!!! I knw that one....it's famous....err but which one.....the one sunflower one or the the many sunflowers one. Either way it's really tough and the background is also very difficult. But u know what Rohitha if u made that effort and completed it, just think how gorgeous it will look framed on ur living room wall:-). Fantastic endeavour. i love your writing style. so engaging. I was there sitting with you, watching you frame your puzzles..
glad you are starting to enjoy the new place. the puzzles are cool! i like them too. good luck on the castle. it is going to look great on the wall. then onto that 3000 piece one..